Nobody wants to be in the way of a 3,700-pound walrus—including other walruses. But they don’t seem to have a choice now that climate change is clearly here. Social mammals, Pacific walruses congregate on land to breed each fall. But in recent years, scientists have noticed a disturbing trend: Walruses are heading to shore earlier in the season and gathering in unusually large numbers at fewer locations because of the loss of sea ice. This overcrowding is leading to increased incidences of tragic stampedes. The U.S. Fish and Wildlife Service reported that 131 walruses in Alaska, mostly calves and yearlings, were trampled to death in 2009. That may not sound like many but, according to the U.S. Geological Survey, it’s a new phenomenon for Alaska. Reports out of Russia are even worse, where an estimated 3,000 to 4,000 walruses died in stampedes in 2007. The Arctic Ocean is expected to be completely ice free in summer by the mid to late part of the century. But it’s in Congress—where a comprehensive climate change bill is long overdue—that we really need the dramatic sea change. Then walruses and other arctic species may have a shot at surviving into the next century. 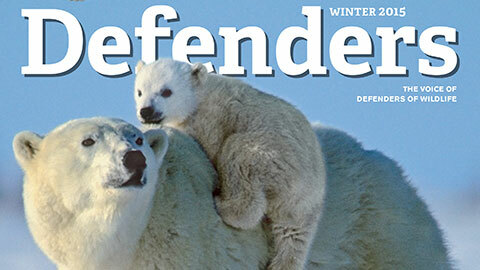 Find out more about what Defenders is doing to save walruses. They can fly but many bird species can’t hide from global climate change. Find out what’s happening and what needs to be done. It’s not every day that county commissioners in the middle of Idaho call for coexistence with wolves rather than death to those that prey on livestock. Hope is on the horizon for Mexican wolves in the American Southwest. Los lobos numbers grew for the first time in four years—from 42 to at least 50, including two breeding pairs—according to the U.S. Fish and Wildlife Service’s (FWS) annual January tally. The lines etched around wildlife biologist Jeff Aardahl’s eyes mark the decades he has spent roving California’s deserts. Wolverines have strength, hardiness, powerful jaws and sharp claws on their side, but Gulo gulo still may not be resilient enough to survive climate change in the American West. When making healthy dinner choices these days, more and more people are turning to fish for a tasty, nutritious, low-calorie meal. It’s hard to believe a population can plummet so quickly. In the 1940s, an estimated 450,000 lions roamed across most of Africa and parts of Asia.